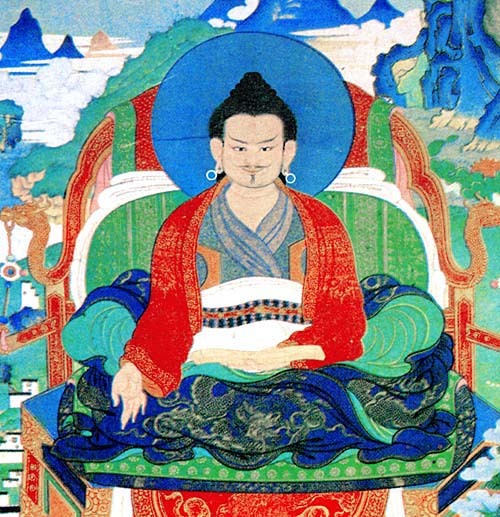 Marpa was an important teacher in the history of Tibetan Buddhism. His firstborn son, Dharma Dode, was his heir. Marpa had a premonition and told Dharma Dode not to attend a festival and not to ride a horse that day, but Dharma Dode did both, was thrown from the horse onto a rocky surface, and died. Thanks to the Rev. Phyllis Hubbell for that story. I use it here to illustrate an aspect of Buddhism that’s hard for many to accept. When we tell people that our suffering and dissatisfaction with life stem from our false assumptions that life should be better than it is, we run the risk of sounding like we’re blaming the victim. Or sounding simplistic as well, like Norman Vincent Peale and his The Power of Positive Thinking. But Buddhism – at least the traditions I resonate with – recognizes that we spend most of our lives here in the “relative” world, where pain is very real and nothing to be ashamed of. When I meditate and focus on my breath, knowing that only the present moment is real, maybe then I’m touching the “absolute” world, where suffering is an illusion. And eventually I can carry that moment-to-moment mindfulness into my every-day, relative life for brief periods. But the traumas of the relative world are real. Since they are an inescapable part of life, we may understand that they need not cause us to suffer, and yet here in this relative world we suffer anyway, and our suffering is real. For me, that’s the point of the Marpa story. Illusions can hurt us, and some illusions are more hurtful than others. Eventually, though, we will return to our breath and our conviction that our only reality is the present moment.